I would like to report a bug, which can be seen occasionally on the Ultimaker 3. I think @kmanstudios and I already reported it when firmware 4 was released. It didn't get much attention because it wasn't seen after reflashing the firmware a couple of times. The bug: After aborting the print with the "abort this print" command the machine makes a blob and does a huge (way to long) retract (up to the error). Attached are all the logfiles as a zip (had to add .log in order to upload it). I hope this helps to locate the bug! I remember the UM3X being stuck on a purge blob/priming blob once or twice. Just sat there and kept spewing out material without moving from the blob location or stopping. But I seem to remember that it was purge, then abort, and then it would not abort and then had to manually shut down. I do not remember the filament going up the tube like your pic though. None of that has happened since though. You may be right. Don't remember all the details. Hasn't happened to me for a while until recently. Wanted to report it as it is a bit annoying/unexpected and can hopefully be fixed. Has anyone at Ultimaker HQ had time to look at the logs yet? I was talking to a colleague and she told me she also spotted this bug at some point! @cjs Sorry for going off-topic, but did you change the (material of) your bowden tubes? They look white instead of semi-transparent. 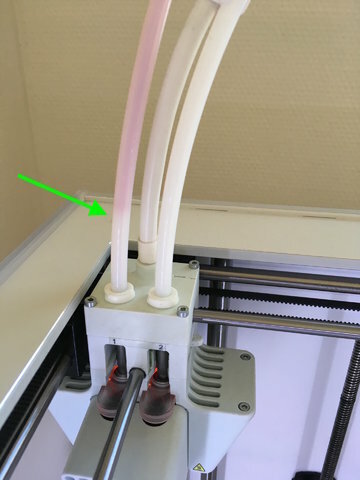 @tomnagel Yes I did indeed change the stock tubing to high quality PTFE tubing as I tested 6+ stock tubes and wasn't happy with the quality Ultimaker sells. Hi @cjs , is the blob also stuck or are you just pointing out the too long retraction? The blob I meant is created on the printed part. The picture was meant to show the looooooong retraction. We know this can happen when you abort a print a couple of times in a row. This behaviour also leads to a print blob that becomes to big (the other way around). We have plans to improve this behaviour in the near future. We have plans to improve this behaviour in the near future. Maybe a stupid question, my apologies in advance, but if this (only?) surfaces when you abort a print repeatedly, it usually means you want to stop the print for whatever reason. Could be a lot of reasons, except the one; print is done and finished. So for what reason does it matter if there is a blob / the nozzle stays on too long? The print is aborted, right? Probably going to be thrown away? Or is it just unexpected behavior we're reporting here? I'm just curious if perhaps I can not come up with the scenario when this would be problematic. In my experience the blob occurs at the start of the "next" print after the abort. In most cases I am trying to reprint after the initial failed print, it is at the prime of the the next print where I get an oversized blob and a long delay during prime before the printhead moves to the start of actual object. Perhaps my ssue is not what other responses are describing? Whenever I have had this happen, it is when it starts to creep up high enough that I worry about the material filling into the printhead that I abort. Otherwise the same, I believe. I has been ages since it last happened. Or is it just unexpected behavior we're reporting here? It's unexpected/wrong behavior as well as the worry that material fills the printhead ( @kmanstudios also reported such) and damages my printer if I don't watch out as it sometimes also goes the other way around. It hasn't happened to me since a long time, but I know it may happen as it hasn't been fixed . Would love to not have to think about it! Same here. I wonder if a firmware upgrade fixed this. I cannot remember the last time it did happen. I wonder if a firmware upgrade fixed this. Just seeing this thread and I have another going on these forums, but as of the latest firmware, I can confirm that I have had the exact same problem @kmanstudios has had - twice in the past few days. For me, it only occurs after the printer has been off for an extended period of time (a day or more) and when I do my first print. After I manually power it off and on (and acknowledge I have cleared the bed), the print automatically resumes and has no issue. It's just super annoying since there are no guarantees as to when it will happen and, when it does, if you aren't watching it, it will dispense filament up into your print head. It has already warped the silicon cover that protects the two hot ends. Hope this helps (and we can get an answer to this).